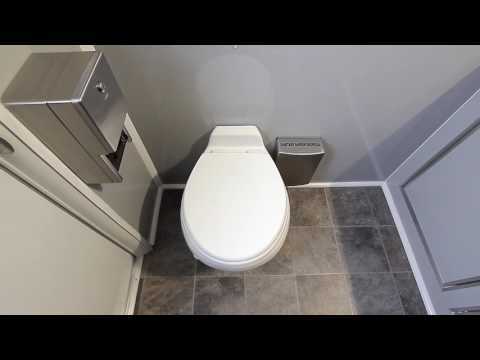 The 3 Station Portable Restrooms Trailer Malibu Series offers a beautiful earth tone interior with coordinating hard-surface vanities is just the beginning of this designer comfort series trailer! The floor plan includes 2 women’s suites and 1 men’s suite, each with a separate entrance. Each suite includes water-saving china flushable toilet, toilet-paper holder, wall-to-wall lockable vanity with solid surface countertops with under mount designer sink, large shatterproof mirror, metered faucets, hot water hand wash and in-counter wastebasket with soap and paper towel dispenser. The men’s suite also includes a water saving urinal. The 3 Station Portable Restrooms Trailer also includes a smooth, durable gray fiberglass interior, insulated walls and ceiling, and one piece aluminum seamless roof with smooth siding. Easy access for guests of all ages with 2 easy steps with full landing and double handrails. Abundant porch lighting at each entry door and 1-piece designer vinyl flooring ensures your guests can enter/ exit safely and securely no matter what time of day or night. Your guests are also sure to enjoy the comfort of a fully climate-controlled environment maintained by air conditioning and heat strips! Smarter Restroom App -The Smarter Restrooms App. is an interactive tool that allows portable restroom rentals fleet owners to monitor operational systems for portable restroom trailer(s) from your smartphone, tablet, or computer. Specifically, it will monitor waste and freshwater tank levels, power, and interior climate control.